It’s always nice to receive praise from a client for a job well done and having recently designed and created a brand-new website for not-for-profit organisation Hampshire Fare, that’s exactly the delightful position we found ourselves in. 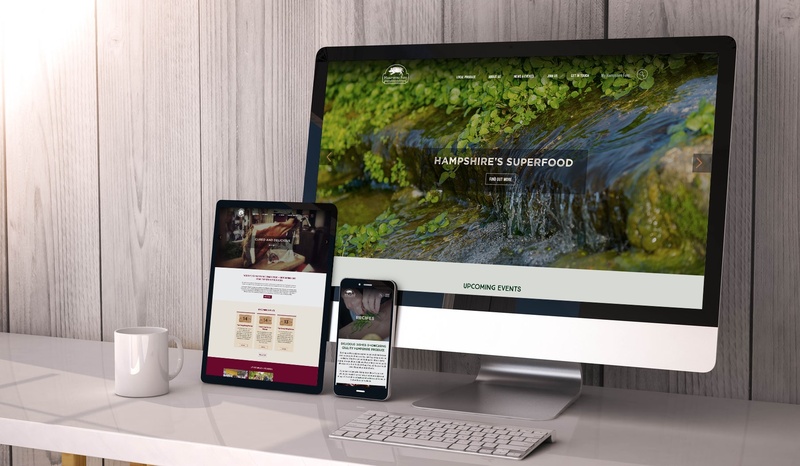 Hampshire Fare’s existing website was built on old technology and was becoming increasingly harder for the supporter of local food, drink and craft producers to manage and update. bandv were tasked with creating a new-look website that would be more user-friendly and easier to navigate for website visitors. With over 400 Hampshire Fare members, the new website would have to be easy to regularly update with a flurry of foodie news. At the same time, bandv were also asked to create a sister site, ‘Hampshire Charcuterie’ to specifically promote Hampshire’s plethora of piggy produce. Being essentially a directory site, Hampshire Fare’s website hold a large amount of data so requires a high degree of administration. bandv worked closely with the client to agree on the best specifications to meet their requirements and it was decided that the new website would be built on the Concrete5 platform. The site redesign focused heavily on streamlining the navigation process for website visitors, allowing them to easily select various types of produce, producer, supplier or outlet as well as being able to view forthcoming events, with a particular emphasis on promoting the annual Hampshire Food Festival. With over 400 local food, drink and craft producers on their books, Hampshire Fare have an attractive collection of photography which the new-look website now effectively showcases. The members directory has also been completely redesigned, allowing members to list their range of products more effectively and in greater detail. The new website now also works far better on mobile devices, whereas the previous site wasn’t mobile-phone compatible. The complex project required a high degree of design and technical know-how, along with dedicated project management from bandv’s Senior Web Developer David Essery and bandv’s Senior Designer & Developer Diarmid Langley. At bandv we pride ourselves on careful planning and clear communication with clients to ensure that each project meets the desired requirements as set out in the original brief. We are delighted with the positive feedback received from Hampshire Fare on this project. At bandv we understand the importance of building and maintaining a great web presence that really connects with your customers and we pride ourselves on building websites with a purpose, that succeed and inspire! The New Hampshire Fare website has been well-received with over 31,000-page views since it launched at the end of January. To find out more about the website and design expertise bandv can offer simply get in touch to request a consultation.